I've been here several times over the last few years, but it was only in February 2008 that I came back to take digital photographs. If you don't know Rougham, pronounced Ruff'm, then this church may surprise you. 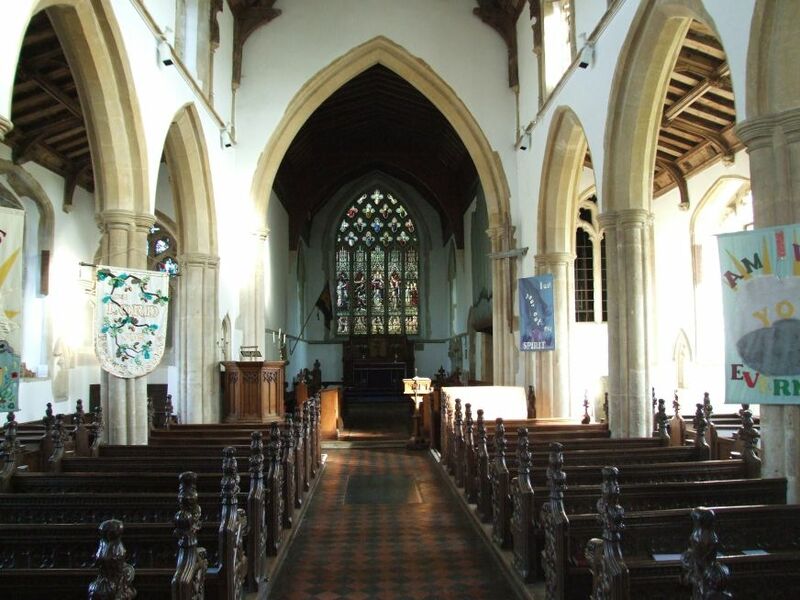 In a part of Suffolk where village churches have a habit of being large, St Mary is bigger and grander than most. It sits a good half mile from its village, on a parallel road, with just the school and an incongruous 1950s Rectory for company. The Rectory actually sits in the churchyard, which is going to make it difficult for the Anglican Diocese to pull its occasional trick of selling it off at some point. I've heard a case made for the isolation of this church from its village being due to the Black Death, which may be true. That case seems to be made for almost every remote church, but is most often 20th century mechanisation that did for the villages, not the Black Death. That 14th century pestilence reduced the population of East Anglia's villages by as much as a third, but the 20th century has been more efficient than that. This is a vast graveyard, by the way; all mid-Suffolk must come here to be buried. The graveyard is neatly clipped in the municipal manner, and the yew trees are thoroughly tamed, but for all that St Mary raises its head gloriously to heaven, a riot of medieval aisles, clerestory and flushwork. This is one of Suffolk's best exteriors,and yet, it is little known. The 15th century tower is superb - of its type, only Elmswell competes with it, for my money. The inscriptions in the flushwork beneath the battlements are clearly visible from the ground. They are dedicatory inscriptions, asking for prayers for the souls of Robert Drury and John Tillot. We have met the Drurys previously at nearby Hawstead. 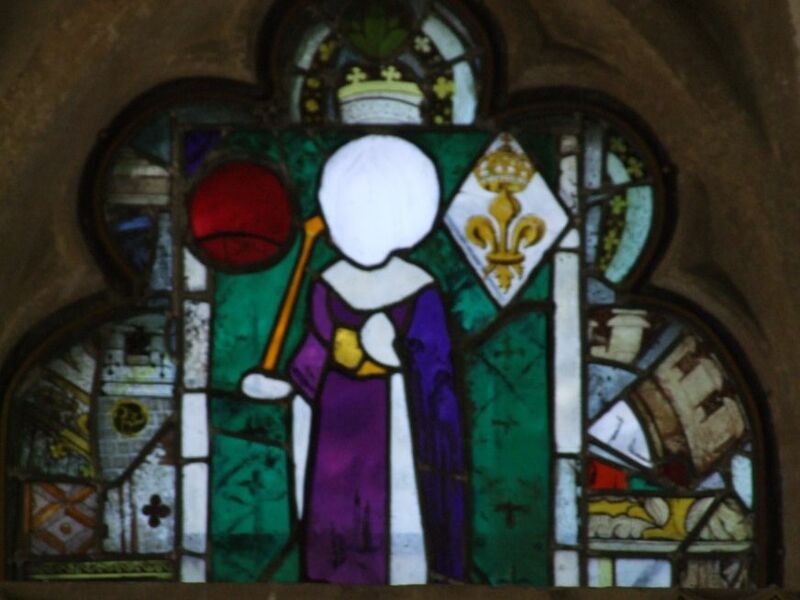 Also beautifully clear (and clearly beautiful) is the Marian imagery, her lily and her monograms. 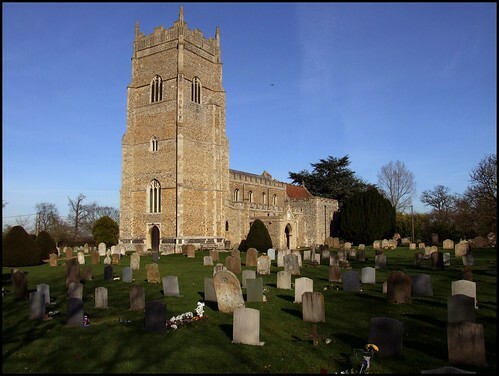 Simon Cotton tells me that it was a big bequest of 50 marks, and as much more as is possible, in 1458 from Roger Tyllot of Rougham, that launched the campaign to build the tower. This guaranteed him the inscription asking us to pray for his soul.The south aisle is a delight, castellated with pierced tracery. One of them has a head in a dish on it, similar to the same thing on the font at Irstead in Norfolk, and it is probably John the Baptist. The south aisle probably predates the tower. But after the tower, and before the Reformation of course, came the north aisle. It can be precisely dated to 1514, because it still bears that date, reading We pray you to remember us that causyde ye yle to be made thus. Rougham church used to be kept locked, but now visitors are welcome. You can see as you step in just how large this church is. The font at the west end has surviving traces of colour. It isn't one of the most exciting ones in Suffolk, but the traceried panels are fine, and were echoed in the great east window at the far end of the building. The tracery of the window is, I think, 19th century, meaning that it is a copy of the font. 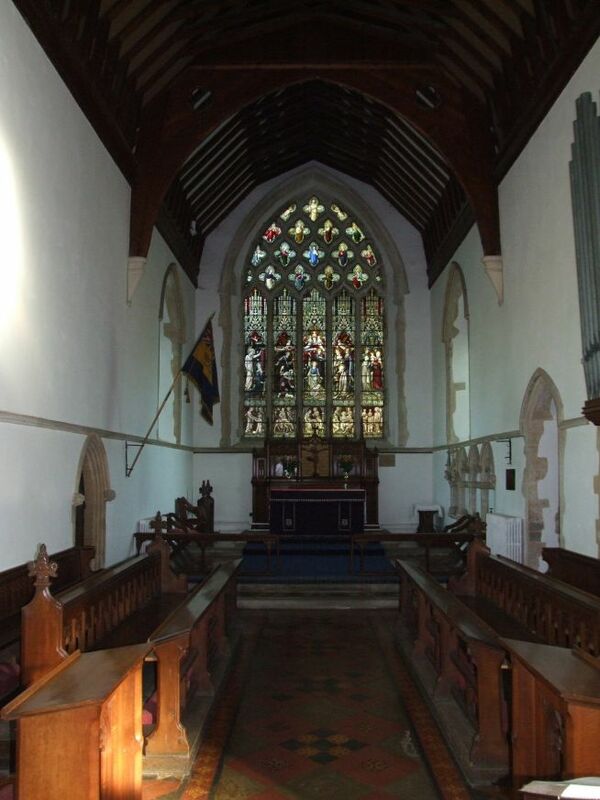 Indeed, most of the chancel is 19th century, and is suggestive of remote High Church shadowy worship with clouds of incense, probably not something that happens at Rougham very often these days. The piscina and sedilia are wholly 19th century, I think, but grand and beautiful. A bit later than the chancel is the excellent glass in the north aisle. Who is it by? The Blessed Virgin and child are seated above an Annunciation scene, flanked on each side by St John the Evangelist and St John the Baptist. To the east, in the aisle chapel window, are fragments of medieval glass, including a restored Blessed Virgin and child, and a Saint with a sword who may be intended as St Paul. Above in the nave is a superb late medieval hammerbeam roof, splendidly uncluttered, and in reasonable condition. The angels on the hammerbeams have lost the heads and wings, and the figures in the niches of the wall posts are also damaged. But that merely serves to show how little restored this roof is. It was made safe as part of a mid-19th century restoration, but never suffered the wholesale restoration of nearby Woolpit, for instance. Woolpit church is quite a useful comparison with this one. One of Suffolk's most famous churches, and along with Mildenhall the county's most glorious medieval angel roof. What else does Woolpit have? 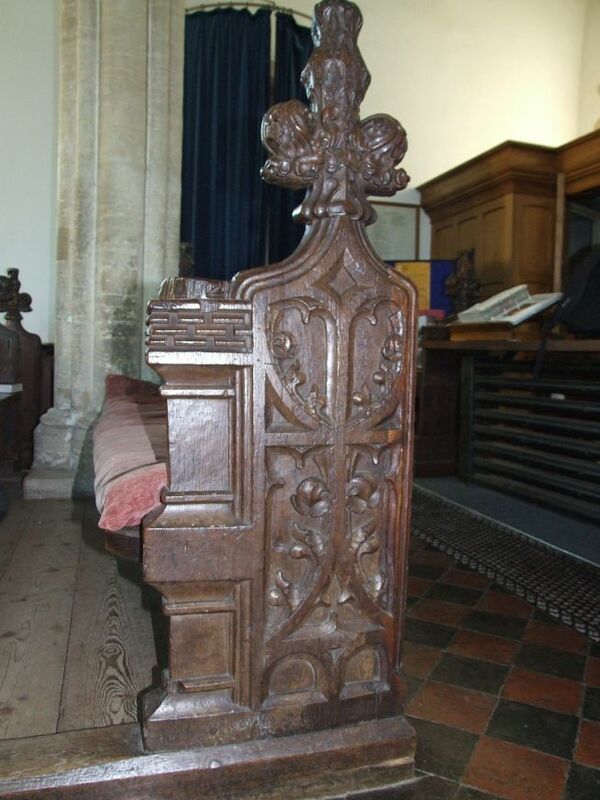 It has carved bench ends in abundance. Now: here at Rougham, look around you. These are as fine a set of medieval benches as you could hope to see - about half the entire range in this huge church are early 16th century, arguable the high point of English carpentry, and contemporary with the roof. But, and here's the point, they are entirely mutilated. Every single bench end figure has been sawn off at the base. So. What happened here? Our knee jerk reaction, obviously enough, is that St Mary suffered from the depredations of the 17th century puritans, and that awful William Dowsing, who saw off all the medieval art treasures that the parish had carefully accumulated over the previous centuries. Unfortunately, this is complete nonsense. Dowsing did not come to Rougham. But he did go to Woolpit (you remember Woolpit - the one that still has an amazing angel roof and beautiful medieval carved bench ends?) So before we start blaming Dowsing, it is as well to look at the evidence. At Woolpit, William Dowsing recorded that his Deputy found 80 superstitious pictures; some he brake down, and the rest he gave orders to take down; and 3 crosses to be taken down in 20 days. The superstitous pictures, of course, were in stained glass, not wall paintings. The three crosses were outside, on the gables. But Dowsing doesn't mention the angel roof (a feature that he concerns himself with often elsewhere) and he doesn't mention the bench ends. Why not? Well, the bench ends problem is solved simply enough. The surviving figures are all animals or mythical beasts. The same survive at neighbouring Tostock, which Dowsing also visited. The reason they survived is simply that the authorities didn't mind them. Despite the portrait that is often painted of him, Dowsing was a conservative soul, and theologically very articulate. He was in the business of rooting out superstitious imagery - that is to say, objects and images that might be used in Catholic liturgical practices. He was also keen to destroy images that he thought blasphemous; for example, symbols of the Trinity, and angels. Dowsing would know very well that Catholics didn't worship animals. So why doesn't Dowsing mention Woolpit's angel roof? I would contend that this is for the very same reason that Rougham didn't need a visit - it had already been defaced. The next obvious question is: when? There are two possibilities. One is that it had been done by other puritans during the furious theological debate over sacramental practice during the 1630s. Far more likely, and the right answer in my opinion, is that the destruction at Rougham was wrought a full hundred years before Dowsing began his progress through the county. During the later years of Henry VIII, and the entire reign of the boy-King Edward VI, roughly 1538 to 1553, order after order went out from the Protestant reformers at Whitehall and Lambeth Palace demanding the destruction of church imagery. Roods came toppling down - not a single one survives in all England. Roodlofts and roodscreens were put to the hatchet and the bonfire. Wall paintings were whitewashed. Fonts were plastered over (why? because this was easier than chiselling off the stone carved imagery) and statues were hauled out of their niches. Some were burnt, or broken up. Many were sold abroad, we know. It was a holocaust of church furnishings. Much evidence of it survives in Suffolk, and it is almost always blamed on the puritans of a century later. Unlike Dowsing, who had a precise remit, and carefully recorded every visit, the 16th century reformers were little short of vandals. Oh, I'm sure that Cranmer and his cronies had a theological basis for their orders, but by the time they reached the parishes, they became a licence to destroy. Eammon Duffy records gangs of drunken youths stumbling around London, breaking into churches and smashing them up, and it is not unlikely that the same thing sometimes happened out in the countryside. In late 1547 in particular, it is as if the gloves came off, and people were able to get away with awful acts with impunity. Duffy records several instances of local landed families fleecing the church of silverware and vestments, and selling them for the proceeds. I think that Rougham's bench ends were sawn off during this holocaust. It would have been a major job, taking several days. What were they? Could they have been representations of the sacraments, virtues and vices, as we find at Tannington, Wilby and Blythburgh? Were they fabulous animals as at Woolpit and Stowlangtoft? Were they images of local people going about their daily business, as at Ixworth Thorpe? Mortlock thought they might have been angels, and that the surviving cushions were clouds. Of course, we will never know. Two things fascinate me in particular. Firstly, you can find exactly the same thing across the A14 at Elmswell, where the medieval bench ends have been sawn off of cushions in the same way. Secondly, when the Victorians carried out their major restoration here, the new benches they installed are exact replicas of the old ones, even down to the sawn-off scars on the cushions! Rougham has two other features of note. 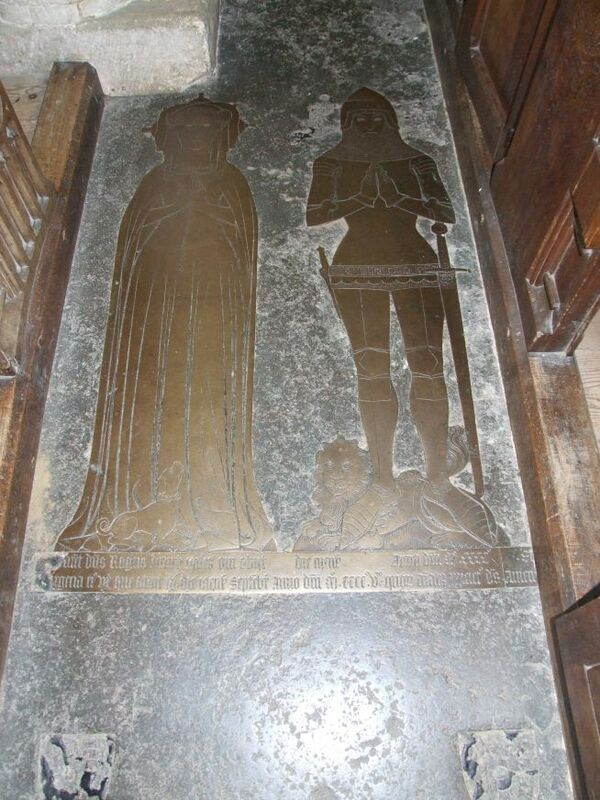 They are fine brasses of Sir Roger Drury and his wife, which survive from 1405. 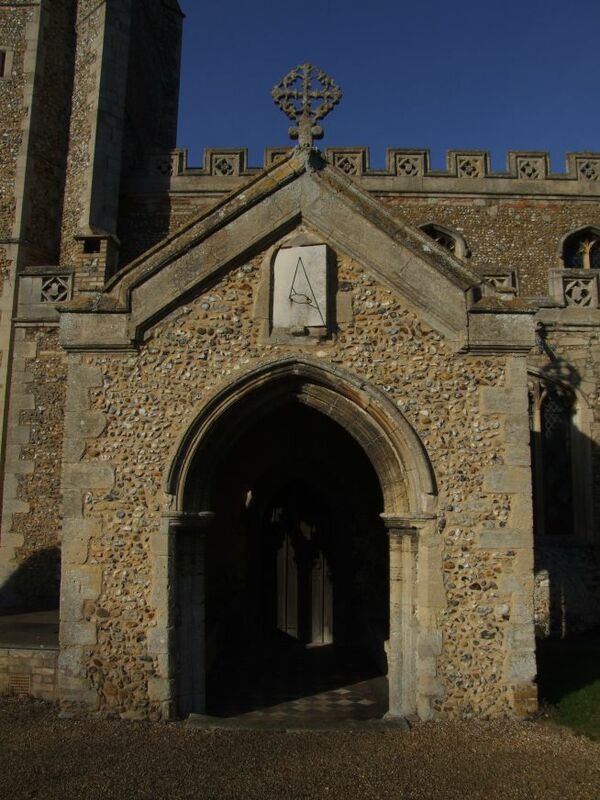 Aidan Semmens observes that they are so similar to the pair to the Burgate family at Burgate in north Suffolk, that it suggests that this was an all-purpose, off-the-peg design. There are replicas nearby for enthusiasts to rub, although I expect nobody does that kind of thing these days. Finally, there is an excellent infill to the base of the tower, a glass screen with the ringing chamber behind. It is very effective. Part of the conversion is the addition of that most unexpected of all facilities in a medieval church - a lavatory.